Hi, it's Gini and I am here today to share with you my first take on the 30 Days of Christmas Cards! I love kraft and gold together, and thought that the Folk Art Angel would be great to use with this color scheme. 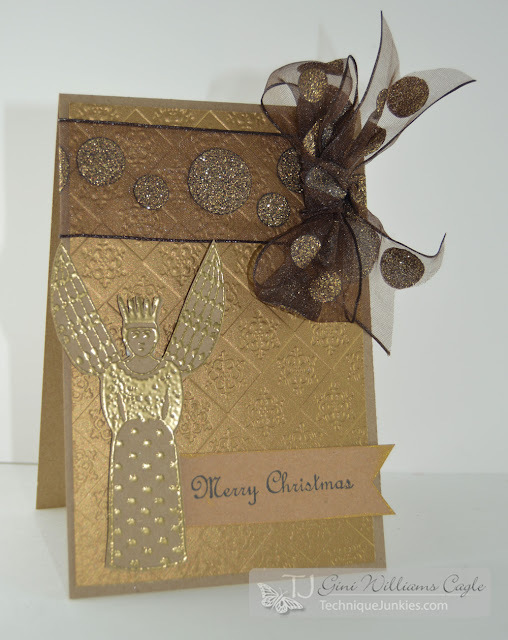 I dry embossed the background and heat embossed the angel. The sentiment, Merry Christmas 2, was stamped on the kraft paper. And what is Christmas without a big festive bow? We will have more ways to inspire you for your Christmas season, so check back everyday between now and the 15th of November!